« Сноукайтинг – Някои го правят и върху сняг! Riding style: Wakestyle, Surf, Wakeskate. She has won numerous competitions. She is always smiling. She has true dreams. 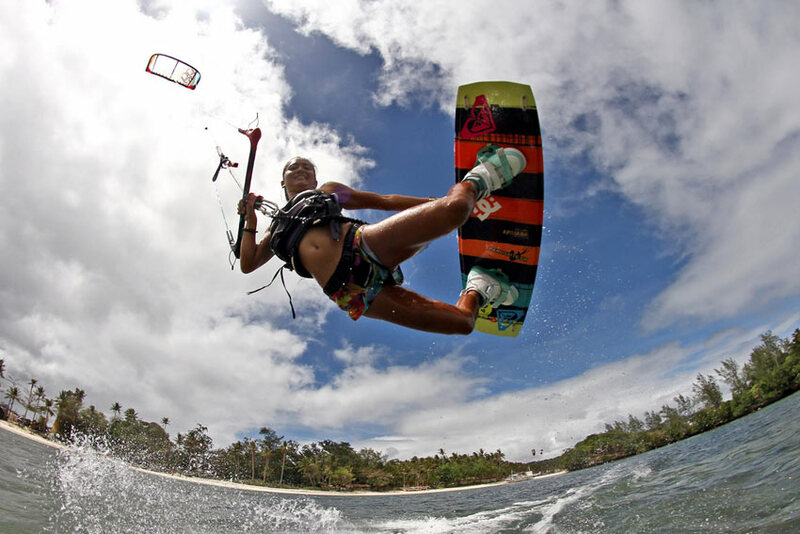 She is strong, extremely beautiful and of course she is a kitesurf girl!!! When I reached her, she was in the middle of “Kiteboard Tour Asia” competition. Ts: Hi, Paula, where do I find you? P: I am in a competition called Kiteboard Tour Asia which is the only ISAF recognized kitesurfing competition here in Asia. For this year there are 4 stops: Indonesia, Thailand, Philippines and China. So, it’s the 2nd leg. This is my first year completing the tour, last year I only did two legs – here in Thailand and in my home spot Boracay. This tour is dedicated to opening doors to Asian riders and also getting new Asians especially girls in the sport. Ts: You are originally from Philippines, right? Did you grow up there, what was your childhood? P: Yes, I grew up in the Philippines, particularly in Manila because the schools are good there. Education is very important in our family. My mom travels a lot for work and she would always tag me along her travels which was really fun, especially all the shopping we did in the cities that she needed to visit. My dad also brings me to his work; he is in construction and likes going to unchartered places, jungles and hikes. So, I kinda got the best of both worlds. Our society is also very traditional and conservative – girls are expected to stay indoors, have fair flawless skin, cook, play the piano, get married and have a family. But my parents were liberal and sporty; they also always signed me up for extracurricular outdoor activities like swimming, skateboarding, rollerblading, biking, theatre arts, ballet, painting classes, piano lessons and so on. My weekends were busy with these activities. With the looks of it, my parents made sure that I stay physically active and also not lose my „girly“ side. While the other girls my age are busy playing with dolls, I was out hanging with my 3 brothers and their friends playing tag, biking, skating, etc. I spent a lot of time in the USA and tried to move there a few times when I was young but the water is too cold, and I loooove staying IN the water, so it was a not for me. Ts: Tell me a little bit about yourself. Music? Interested in..?Or it is all about water and wind? I always end up too busy so now as I am maturing, all the things that I do are those that I LOVE. Passion is something you should have so you don’t think there is an effort at all in anything that you do and also time is one thing you cannot buy so I always make sure that I use my time wisely. I am a very visual person as well; I love photography, videography and freehand drawing a lot. I have a few artworks myself but inspiration is hard to come by recently due to my busy schedule. Ts: How come that you started kitesurfing? Did you start because of a hero or following a dream? P: I’ve always been a waterbaby. I grew up spending my weekends in the beach and eventually got into surfing at a very young age. Although school was pretty busy and I love school too, plus my mom would kill me if I failed my classes, so my time surfing became less and less. When I started spending more time in Boracay I got into skimboarding, which is the closest thing we, beach kids, have as skateboarding. I briefly competed in skimboarding where I met one of my current sponsors, tribu outdoors. One time I was skimboarding and hanging out with my friends during a cold stormy low season day in Boracay, we saw some of our friends kitesurfing. This is my very first lesson with a trainer kite. But I didn’t continue kiteboarding until late 2010. 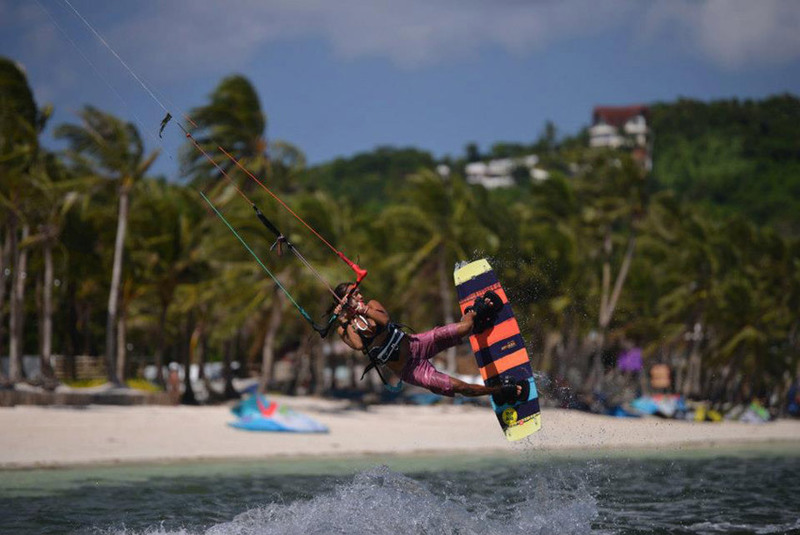 From that first time with a trainer kite I moved away from Boracay and got into another boardsport – cable wakeboarding and ended working on the country’s biggest cable park and lifestyle store/ brand. On these years I got hooked on sliders and wakeskating from time to time. It wasn’t only until December 2010 where I seriously took kiting, moved back to Boracay and pleading my friends to take me out kiting. 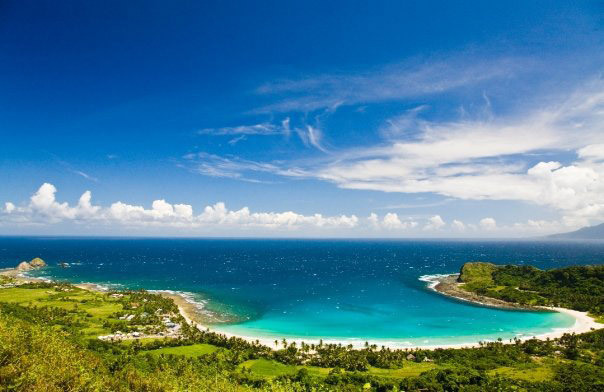 I cried a few times, broke a few kites, stepped into gazillions of sea urchin and flew a couple of meters up because I always pull the bar – due to my cable wakeboarding mechanism. I was hooked on my first ride. I even moved to the kite beach, waking up at 6am so I can learn to kite while there were not so many people on the beach. This was one of the best times of my life. Sunrise kiting was awesome. Ts: How long have you been doing this? P: This is my 3rd year in Kitesurfing. P: I love boardsports, especially wakeboarding and surfing. 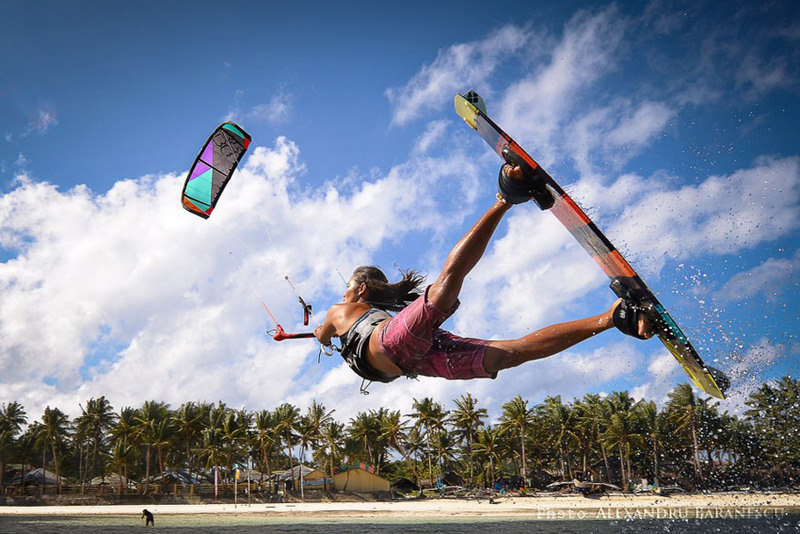 Kitesurfing gives me the freedom to practice both in Boracay, we have a lagoon that is flat during low tide so I can do a nice wake-style session, during high tide and when the wind is strong our waves far back upwind in the reef gives a nice swell to surf in. The only thing I am missing is a slider. I also had a few injuries from skating and wakeboarding (especially wakeboarding) because I am only 50kilos and the cable is too strong for me at times. kitesurfing gives me the freedom to adjust sails that is fit for my body so I don’t break it as much as I did with the cable, and also being a free energy sport, requiring no gas or machine is the best part about it. Ts: What does this sport mean to you? P: To date, this is the main part of my life aside from my work, family and friends. This sport is just so beautiful, expressive and also a sport for the mind – I believe that’s why I like it, and it gives me a fresh outlook on life all the time as neither session is similar to the others. P: Since I have a wakeboarding background, I love sliders and different kinds of grabs. Ts: Paula, I find you really inspirational for our girls auditory. You are a girl, does this help you or the time you started boys were deprecating you? P: Yes but I’ve always been hardheaded and I have 3 brothers that are always fighting with me when we were young so I always had to keep up with them and brush all their immature remarks aside, it’s always been a go big or go home thing for me when I was young. I would cry at times but I always look at everything as a challenge and test of character. Ts: What keeps you going further? P: Other girls that want to get into the board-sports always inspire me to do more. Ts: Vision…your wishes for the future? P: I wish more girls, especially Asian girls to get into kiting. One of the reasons why I promote kiting so much is so that other girls would see that it’s not impossible to do this just because you are a girl. And also kiting with a lot of grace and poise too! Ts: And finally, can you please advise our lady readers why should they at least try kitesurfing? P: Kiting is something that has empowered me to do more. Although it was hard in the first few tries don’t forget that it’s all about the fun and just take it at your own pace, and if I can do it, for sure all you girls can do it too! Fun and also a good work out for your abs while getting that gorgeous tan! This entry was posted on четвъртък, март 28th, 2013 at 11:14 and is filed under Екстремни Cпортове, Кайт Информация, Кайтсърф Снимки. You can follow any responses to this entry through the RSS 2.0 feed. You can leave a response, or trackback from your own site.